To out-compete your surroundings, you need signage that is clearly noticeable from afar and continues to “speak” to potential customers as they draw near. Attention-grabbing signage is bold and simple. It instantly tells folks what your kiosk is all about, and it is instantly recognizable as your brand. Your kiosk may sit in a location that has plenty of ambient lighting, but you need more. It’s easy to overlook specialty lighting when thinking about how to build a kiosk, but spotlights can draw the eye to your space. They can illuminate your signage, specific displays, and individual featured items. Tiny lights can provide twinkly decorative elements. Don’t forget that lighting comes in colors, too. Customization is essential, but you may be able to save money by basing your design on existing modular components. Creatively combining modular elements shortens the time needed for design and fabrication, and it saves money, helping you stay within your budget without sacrificing uniqueness and branding. Modular units that are portable can be an even bigger boon for your design as well as your budget. You can rearrange them periodically for a no-cost remodel that keeps your kiosk looking refreshed and interesting to returning customers. Self-service kiosks are interactive by nature, but in a busy mall or outdoors where you need maximum attention-grabbing allure, interactive elements can be your best friend. Digital signage, video displays, and touchscreens entice shoppers to come closer and stimulate engagement. They can enable customers to create their own personalized products or understand how to use or wear your merchandise. One of the nice benefits of interactive elements is that they give customers a broader multi-sensory experience. Along that same line, if you’ve got an edge over the competition when it comes to product aroma or sound, flaunt it – in an appropriate way, no blaring music, please. Design a space for sampling, where you can open a package of chocolates or set out a few perfume or lotion testers. If you sell wind chimes, use a tiny fan to get one or two of them moving and making noise. A mall kiosk is in full view, yet it can easily become invisible to passers-by. 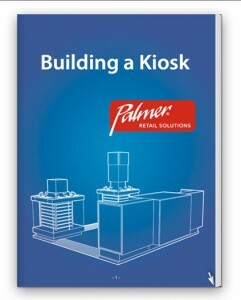 Knowing how to build a kiosk creatively will give you a distinct advantage. Irresistible design and must-see, must-try displays will make your kiosk a big success with customers and happily profitable for you.